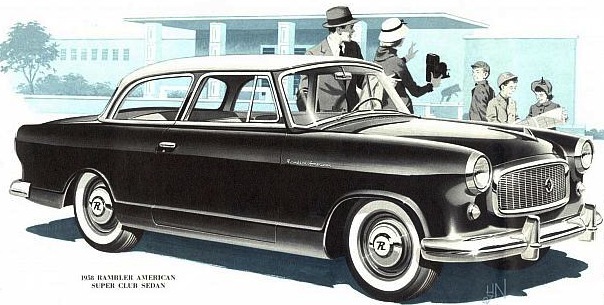 Advertising claimed, "crisp clean lines" of the 1959 Rambler American "will remain in style for years to come." American Motors laid the Hudson and Nash names to rest at the end of the 1957 selling season. The independent automaker pinned its future on the compact Rambler. The company was on its way up, taking 12th place in the US market that year. The Canadian operation was shut down in August of 1957 because the plant on Toronto's Danforth was losing money. The underlying problem was that not enough components were manufactured in Canada. Tax and duty on the imported parts made the cars too expensive. 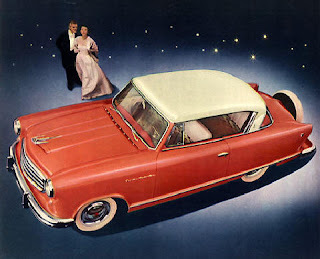 The 1958 Rambler was stylish but the lineup lacked two-door models. While the Rambler name was doing extremely well, there was a serious gap in the product lineup. Dealers and product planners alike noted there were no two-door models. Executives knew there was no money to tool up any two-door cars. Some magic wand needed to be waved and waved quickly of American Motors was to survive and grow. George Romney, the company's CEO went to Britian where he held exploratory talks with Austin. Austin already built the charming little Metropolitan for American Motors. Romney hoped to purchase the company. Its small car expertise was exactly what American Motors needed. The Longbridge automaker's models nicely complimented AM's lineup and the two product lines would sell well in the North American market. 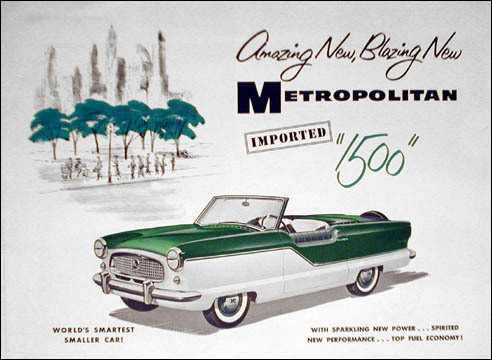 Metropolitan was built for American Motors and imported from the United Kingdom. The British automaker was not interested in a more cozy arrangement with American Motors. Romney then went to Wolfsburg, West Germany and offered to merge AM with Volkswagen. He was rebuffed there, too. 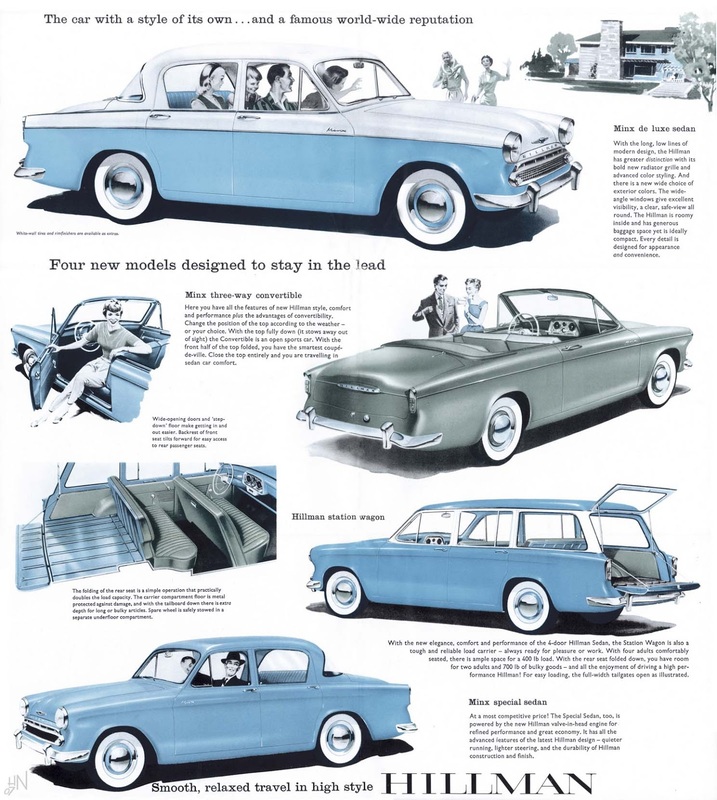 So, in a sleight-of-hand movement that astonished the automobile industry, Romney ordered the dies for the the 1955 Rambler be brought out of storage and put back into production. No manufacturer had ever resurrected a model from the past and offered it to the public. It was a daring, gutsy gamble. Romney calculated the car would do well. The 1955 Nash Rambler Custom Country Club. The discontinued Rambler had garnered the highest resale value of any North American-built car for several years in a row. It was held in highest esteem by consumers. Before being reintroduced, the styling was freshened up a bit. The steel tartan grille gave way to a fine-mesh affair and rear wheelwells got fuller cutouts. Vice President Roy Chapin's suggestion to turn the taillights upside down gave a new look and saved precious retooling dollars. The 1958 Hillman Minx was direct competition to the Rambler American. The names committee put forward several possible monikers for the newest Ramber. Suggestions included 100--for the 100-inch (2 540-millimetre) wheelbase but the name finally chosen was American. Its intended targets were European imports with names like Ford Anglia, Hillman Minx, Opel Rekord, Renault Dauphine, Vauxhall Victor, Fiat 1100, Simca Arronde and the biggest competitor of all--Volkswagen. One AMC official told this author that there was talk of selling the car in Canada as the Rambler Canadian but that never materialized. The 1958 Rambler American two-door sedan sold for $2,398 in Super trim and weighed in at 1 113 kilos (2,500 pounds). In January of 1958 the smaller American was trotted out as a two-door model in Super trim or the lesser appointed Deluxe. There was no pretense that this was a new car, advertising boldly proclaimed that the American was "here by popular demand." The plain, eight-page black and white sales folder emphasized the economy and thrift of owning a Rambler American. Options were held to a minimum. Flash-O-Matic transmission eliminated the clutch, or one could order overdrive. The famed Weather-Eye heater was the best in the industry. (General Motors bought AMC's heaters and air-conditioning units for all of its cars.) One could order a manual-tune radio, an electric clock, a glove box light, a custom steering wheel, the famous Airliner reclining seats and foam padding for the rear seat. Outside there were two-tone colour combinations to consider, a mirror (driver's side only), Solex glass, undercoating, heavy-duty springs and shocks, full-wheel discs, and optional tire choices. Under the hood one could have the optional oil bath air cleaner and the extra-cost windshield washer. In a decade of wretched excess, people believed that the simple, understated Rambler was synonymous with lasting design, quality and durability. 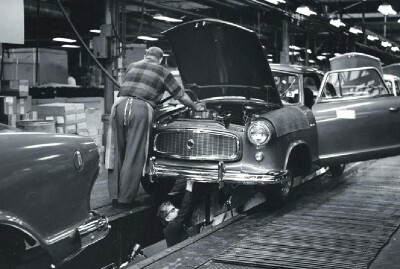 More than 30,000 of the two-door Rambler Americans scooted out the factory doors. Sales more than tripled for the marque. It was the new American that provided the extra boost to push American Motors into the black for the first time since the company came into being in 1954. With $26 million profit on sales of 162,000 units during the model year, the little independent captured seventh place in the sales game. 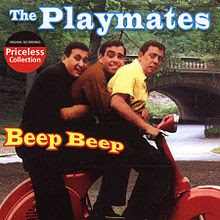 The Playmates hit Beep Beep was on the Top 40 chart for twelve weeks in 1958. Ramblers were more than cars, they represented a desirable lifestyle. The marque was immortalized when the pop singing group, The Playmates, recorded Beep! Beep! in 1958. The catchy ballad told the tale of a little Nash Rambler that undertook to pass a Cadillac on the highway. Underdog Rambler won the day and consumers felt downright good about themselves and their Ramblers. Like Rambler itself, the song rose to the top of the charts, hitting the number four spot. 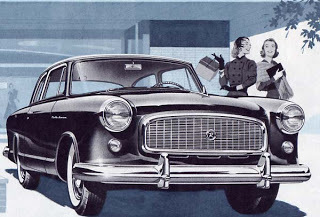 The 1959 Lark by Studebaker was Rambler's first home-grown competition. The next fall styling stood pat for the Rambler American. Studebaker's new Lark would take but a few sales from Rambler and The Big Three had yet to level their guns at the independents with their own compact cars. Rambler's lineup was good looking and looking good. From flagship Ambassador to the tiny Metropolitan, Rambler dealers had it all and all under one roof. The 1959 Rambler American two-door station wagon boosted sales significantly for American Motors. The American family got a new and very welcome addition as the two-door station wagon made its debut. Consumers demanded the common-sense Ramblers as a business depression deepened. The adorable continental spare was added to the option list as was an inside tilt rear-view mirror and a heavy-duty cooling unit. 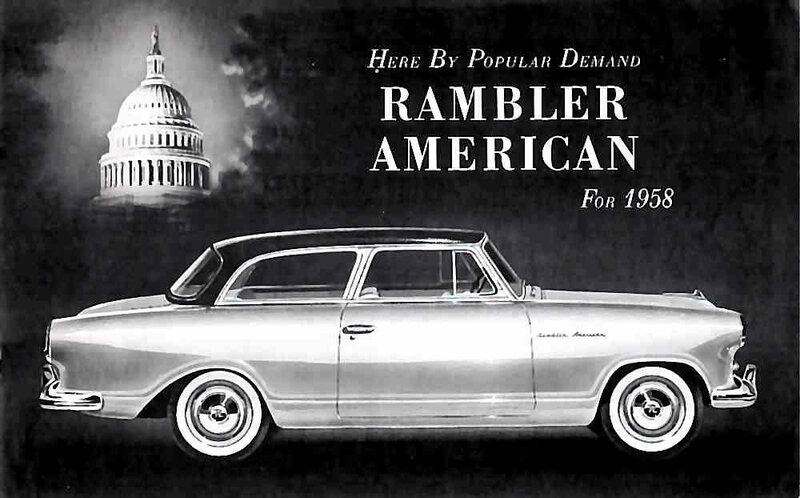 More than 90,000 Americans were sold in the US in 1959, driving Rambler up the sales ladder to fourth place. Profits of USD$60 million were realized on net sales of USD $869 million. 1959 Rambler Americans were built in Kenosha, Wisconsin and exported to Canada.